Covered call writing results can be enhanced through the use of leveraged ETFs and margin accounts. However, so too is the risk elevated. In this article, the pros and cons of these strategies are examined. Leveraged ETF: An exchange-traded fund (ETF) that uses financial derivatives and debt to magnify the returns of an underlying index. Margin account: A brokerage account where the client has the ability to borrow money from the broker to buy securities. The loan is collateralized by the cash and securities in the account. QQQ: This is the ticker symbol for the Nasdaq 100 Trust, an ETF that trades on the Nasdaq exchange and consists of 100 of the largest non-financial companies that trade on the Nasdaq. TQQQ: ProShares UltraPro QQQ seeks daily investment results, before fees and expenses, that correspond to three times (3x) the daily performance of the NASDAQ-100 Index. Since goals are daily-based, longer-term results will not usually coincide with triple the returns of QQQ. In the past 6 months, QQQ is down 2.5% while TQQQ is lower by 15%, clearly reflecting much worse than long-term triple results and highlighting the risk involved with leveraged ETFs. 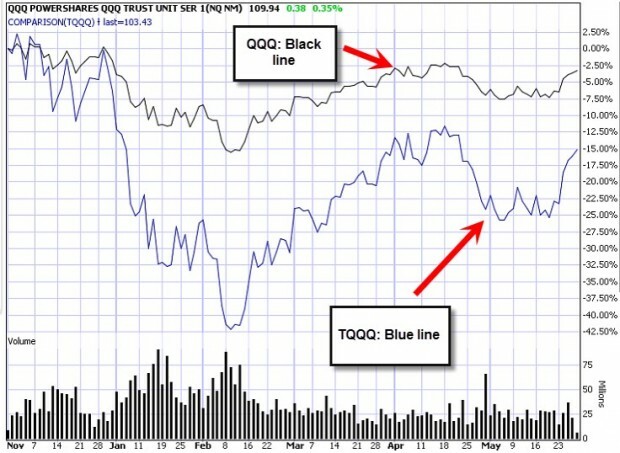 Of course, if QQQ had appreciated over the same time frame, TQQ would have appreciated significantly more. QQQ has the potential to generate a 1.6% (1.5% + 0.1%), 1-month return while TQQQ offers the possibility of a 3.4% (2.9% + 0.5%), 1-month return, highlighting the advantage of leveraged ETFs. If trading was in a margin account where 50% of the cash is borrowed to buy the leveraged ETF, the gains and losses would be magnified by approximately two-fold, accounting for the cost to borrow (interest paid to broker). We must also factor in the chance of margin call wherein if security prices fall to a certain level, investors may be required to add more cash into the account or sell certain securities perhaps at a loss. Click here for more on margin accounts. Utilizing leveraged ETFs and margin accounts is not appropriate for most retail investors because of the enhanced risk inherent with these strategies. However, for some sophisticated investors with a high risk-tolerance, these tools may be appropriate. Saturday morning 3-hour workshop at the Plainview Holiday Inn. 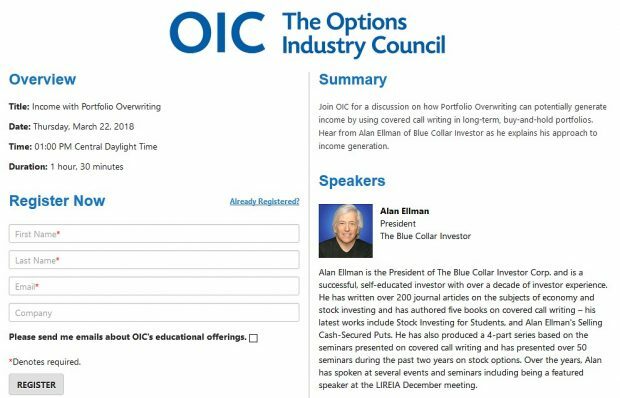 I am the only speaker and plan an information-packed presentation covering 5 actionable ways to make money or buy a stock at a discount using both call and put options. We will also evaluate the stocks you currently own for option-selling. Bring a list of stocks currently in your portfolio. For the week, the S&P 500 rose by 0.38% for a year-to-date return of +4.76%. BCI: My plan for the November contracts is to continue to favor in-the-money strikes 2-to-1. I’m factoring in the upcoming election and Fed watch. The charts point to a neutral to slightly bearish outlook. In the past six months the S&P 500 declined by 1% while the VIX rose by 5%. Thanks for the fantastic article on S&P Futures and Fair Value in one of your previous blog articles. As a beginner it brought a lot of the pieces together that I didn’t grasp reading other articles. Can you please point me in the right direction for those? Thanks again for the great article. This is the site we use for dividend yield information in our Premium Member Stock Reports. Remember to take both annualized dividend and interest rate stats calculate based on the specific time frame FV is being calculated. I am trying to understand the big picture and how computerized investing by the big guys affected options. I am also trying to understand the strategy and thinking of the parties buying your options. Is it win win for both sides? My understanding is that they buy stocks or options when mispriced by their models? On different trading boards? Institutional traders are always looking for arbitrage opportunities where there is a guaranteed profit due to inefficient pricing. Computerized trading only decreases these opportunities making the market more efficient in my view. Stocks and options are purchased for different reasons, hedging (to decrease market risk) and speculating (values going up) are the main goals. They provide the market that allows us to generate cash flow by selling options. It can be a win-win in some cases but not always. It is not a zero sum game. For example, we can generate a nice covered call return and the option buyer can also generate a profit. This week’s Weekly Stock Screen And Watch List has been uploaded to The Blue Collar Investor Premium Member site and is available for download in the “Reports” section. Look for the report dated 10/21/16. Premium members please note that as we enter the heart of earnings season, 9 of the first 10 stocks (NUVA currently does not have adequate open interest) in the gold cells in our recent premium Watch List will be eligible for option-selling after the first week of the November contracts. In addition to this, the stocks in the white cells plus all the ETFs in the recent ETF are eligible for consideration. Since tomorrow starts November regular expiry I am interested if I you are doing anything different with duration because of the election? I understand your Nov strike price selections as shared above and influenced by the elections as a factor. Many of us made Brexit adjustments to dodge the date of the vote. Similarly, I am only writing covered calls and cash secured puts through Nov 4th for now even though I too prefer monthlies. I do not know who will win. But Brexit reminded me of the limits of opinion polling. As soon as a winner is known, even if challenged, I think money will flow towards the asset classes and sectors perceived as favored by the presumptive winner. For the ability to respond quickly without undue trading loses – to say nothing for the peace of mind a larger than normal cash trading position might provide on election night – this conservative trader is in the cash building business over the next couple weeks! Your approach is extremely intelligent. Although we can’t fear every upcoming event, this election, in particular, has the potential to impact the market more than others. Without getting political one way or the other and just looking non-emotionally at the facts, it appears to me that the institutional traders are hoping for a Clinton victory. I base this on the market reaction to the 3 debates which, according to the reliable polls, had Clinton coming out on top. This is a statistical analysis, non-subjective in nature. With the polls, at this time, showing a strong bias to a Clinton win, a strong downturn post-election appears unlikely. Who knows what the next 15 days will bring but at this time I am still taking a defensive posture as I have the past several weeks but remain fully invested. If there is a change in overall market risk, I reserve the right to close my positions. The pre-Brexit vote appeared a lot closer and that is why I went 1/3 cash prior to the actual vote. Those with a greater post-election concern than I have should favor your approach. October expiration Friday left me with 70% in cash. This week is the perfect time to place new trades, but the elections event is dangerous. I prefer to miss oportunities instead of risking losses. Caution is my choice. I’ll come back when the storm is over. There is still two weeks to go and premium to be made so do not sit out until Nov 4th :)! I wish I had Alan’s confidence but I do not believe what people tell pollsters. you are perfectly right. Many times people say one thing to a polster, and then do the opposite. It is tough to stay out for one whole contract month, and I envy Alan’s confidence too, but with earnings season + FED watch + elections, etc., I prefer to miss out, and come back later. Hello, thanks for the article on leveraged ETFs. I do understand the risk, but, if you include buying a PUT in the investment strategy it does limit the potential loss, and we can still keep writing covered calls. Protective puts absolutely do protect on the downside. It is a form of insurance that we pay for. Because the underlying, in the case of leveraged ETFs, generally has a high implied volatility, the cost of the put will also be high as will be the premium generated from the sale of the call. Using lower implied volatility underlying securities may not necessitate the purchase of protective puts for many investors and so we must weigh the pros and cons of each approach and see which meets our personal risk tolerance. My personal preference (may or may not be right for others) is to use underlyings that generate initial returns of 2-4% and not use protective puts but to be prepared with all our exit strategy position management techniques. I’m considering entering a trade in EEM emerging markets ETF. My question are other ETF’S such as Mexico EWW and Brazil EWZ closely correlated with EEM and thus I should avoid having all 3 ETF’S in my portfolio at the same time? I can’t give specific advice in this venue but I can offer some ideas you may find useful. You have definitely selected 3 of the top-performing ETFs available for option-selling. All 3 have implied volatilities between 20-30 as shown on pages 7-8 of our most recent ETF report. So far, so good. When deciding whether to incorporate different securities that may fall under the umbrella of a broad category I evaluate the portfolio as a whole. For example, if these are the only 3 securities in a portfolio, I may look to better diversify. If my portfolio consisted of 10 securities, I very well may include all 3. Is it pointless to re-invest dividends when trading options? On expiration Friday, I was left with 1.8 shares of one stock because of this. Apparently if there is less than one share, Fidelity sells the complete holding and if there is more than 1 share balance they do not sell it with the assignment of a call, so you are left with some share balance, which is subject to a commission again if I want to sell it. To please me, I will call Fidelity and ask them if they can give me a free trade credit to compensate for this issue. They did this also for another issue I have some time ago. Most brokerages will liquidate the fractional shares at the end of the trading day in conjunction with whole shares sold at no extra charge. Now, in the case where we have more than 1 share + a fractional amount that we sell there will be a commission but most brokerages will usually decrease the commission amount based on the dollar amount of the trade. Either way, it’s found money. Your point is a good one that when selling options and NOT holding the stock in a long-term portfolio, taking cash payments is a better alternative. I am a new subscriber to BCI. I am having trouble understanding the statement from my virtual trading. The options are listed in parenthesis meaning a liability. Why is that? I thought that money is available immediately to trade. My stocks are worth 32982 but my account value is 23095.19. Am I losing 8209.81 or gaining 8209.81. I hope you can help me make sense of this. Is my understanding correct that the current TV of an option holding is not important if simply rolling up or down, but will impact the final outcome if the position is also being rolled out? I would find some clarification of this most helpful. After a position is entered, the time value is a factor when we buy back the option for an exit strategy. That’s why we have the 20/10% guidelines as well as other guidelines. As an example, when considering the “Mid Contract Unwind” exit strategy, we factor in the time value cost-to-close. If no exit strategy opportunity presents itself, time value is not a factor as we know that Theta (time value erosion) will cause TV to approach zero as 4 PM ET on expiration Friday approaches. At that point, the option either expires worthless (if out-of-the-money) or is exercised (if in-the-money). You are 100% correct that when rolling out or out-and-up, time value is a factor that must be measured and evaluated. Broadcom is a chipmaker based in Singapore that targets wireless communications, wired infrastructure, enterprise storage and industrial services. On September 1, 2016 AVGO reported a stellar 3rd quarter earnings report beating consensus by 8% with revenues up 7%. The latter stat represents a 119% increase from the same quarter a year ago. This has led to analysts raising target estimates with a projection of EPS growth of 17.7% for the next fiscal year. This would represent a PE ratio still below 15x. The average price target is near $200.00 per share with the stock currently trading near $174.00 per share. Our Premium Running List shows an IBD 50 rank of “27”, “Chips” industry rank of “A”, a beta of 1.39, a % dividend yield of 1.20%, last ex-date 9/15/2016, next ER date 12/1/2016, Weeklys available, adequate open interest for near-the-money strikes and AVGO has been on this list for the past 15 weeks. A comparison chart for the past 1 year shows the S&P 500 up in value by 3% while AVGO has been up by 42.5% as shown in the screenshot below. It’s been a wonderful ride for many of us. I have been enjoying your material..videos.. 1 question please: I followed a website called 10 percent fora couple of years and watched them make good monthly profits, mainly using iron condors. I thought it was amazing. Until a big market correction… now they fell off the planet. I assume they lost to much in the correction. So it seems that making monthly gains was all wiped out with 1 large correction. Wont the same thing happen to you? I am asking to learn, Im not challenging you. It seems to me you will lose all the small gains with a correction and they will not really buffer… especially your naked put selling…. Do you hedge your portfolio??? Please explain. No this will not happen to me (lose everything and fall off the planet). In 2008 I lost 15% of my portfolio value. It was an extreme aberration that, looking back, I could have managed much better. I way-out-performed the “market” but still lost 15% Looking back, I would give myself a “C” for performance that year. Now in less extreme bear markets, neutral markets and bull markets we will have many more winning trades than losing trades but let’s concentrate on your hypothetical of a major correction. Mastering all 3 required skills for option-selling will prevent us from a disastrous outcome even in extreme circumstances.